Marlee Hayes wrote this post as a final project for Stacy Krueger-Hadfield’s Science Communication course at the University of Alabama at Birmingham. Her primary interests focus on challenges in conservation and sustainability. 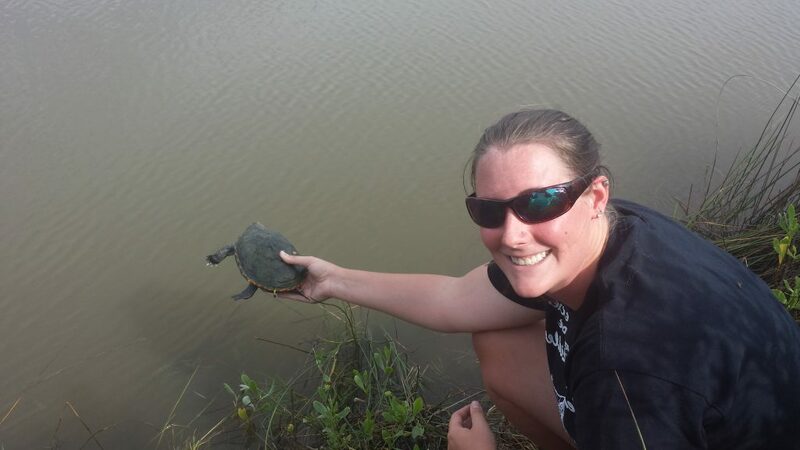 Previously, she evaluated fitness of post-hatchling Diamondback terrapins (Malaclemys terrapin), a species of conservation concern in Alabama. She is currently a MS student at UAB studying nutrition and feed intake in the sea urchin Lytechinus variegatus. The sea urchin has potential for aquaculture and is also an aquatic model organism, often used to study embryonic development. She is part of a group at UAB developing sustainable sea urchin culture techniques. What’s for dinner? Just 50 years ago, turtle soup might have been! 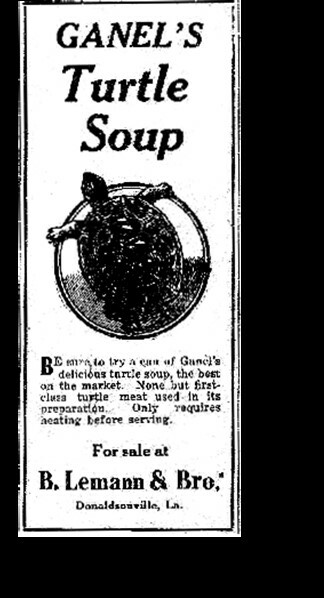 In North America, terrapin soup became a popular meal in restaurants and coastal households in the 1800s, which ultimately resulted in a significant decline in terrapin populations by the 1900s (Hart & Lee 2006). Though many regions of the globe have prohbited turtle harvest, there are still areas where it is legal and other areas where poaching is a major concern. The legacy of turtle soup has left an indelible mark on turtle populations. The diamondback terrapin Malaclemys terrapin is one of the few turtles that thrive in brackish water ecosystems along North American Atlantic and Gulf Coasts (Coleman et al. 2011). In addition to harvesting, the diamondback terrapin continues to face consequences of by-catch in crab (Coleman et al. 2011). Human colonization of coastal areas brings its own set of problems, bringing with it raccoons that often raid terrapin nests (Munscher et al. 2012). Furthermore, large amounts of trash accumulate along critical nesting grounds in estuaries and marshes, which may ultimately impede nesting female terrapins. Due to declining populations, many conservation projects have been launched to aid the recovery of the diamondback terrapin. It is protected by legislatures in many states and is listed as “near threatened” status by the IUCN. 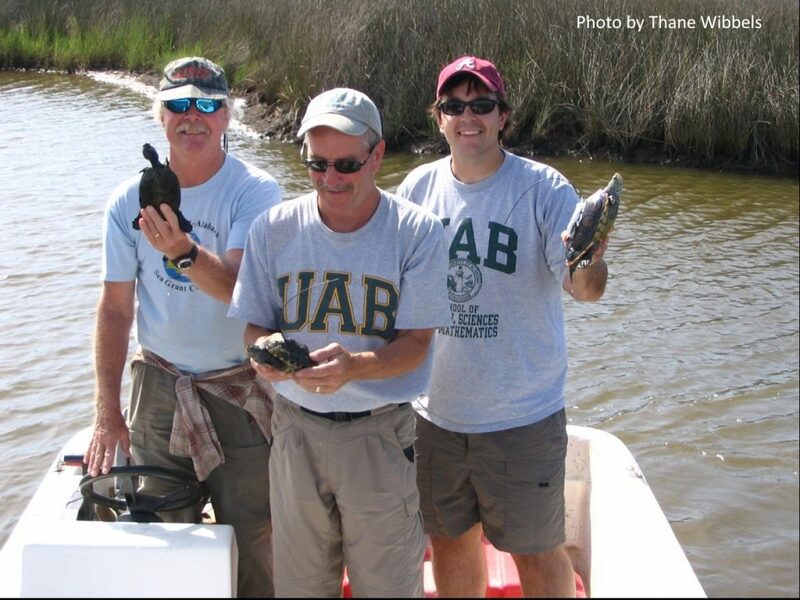 In 2004, the Diamondback Terrapin Working Group was formed and academic institutions, such as The University of Alabama at Birmingham, continue recovery efforts. Though we know quite a bit about its biology, ecology, and conservation, we don’t know that much about population connectivity. Understanding population structure and gene flow will allow for strategic conservation plans best suited for different populations. Dr. Ken Marion (left), Dr. Thane Wibbels (center), and Andy Coleman (right) from the University of Alabama at Birmingham working at their field site in Dauphin Island, AL. A crucial nesting marsh for the Mississippi diamondback terrapin is located on this barrier island. 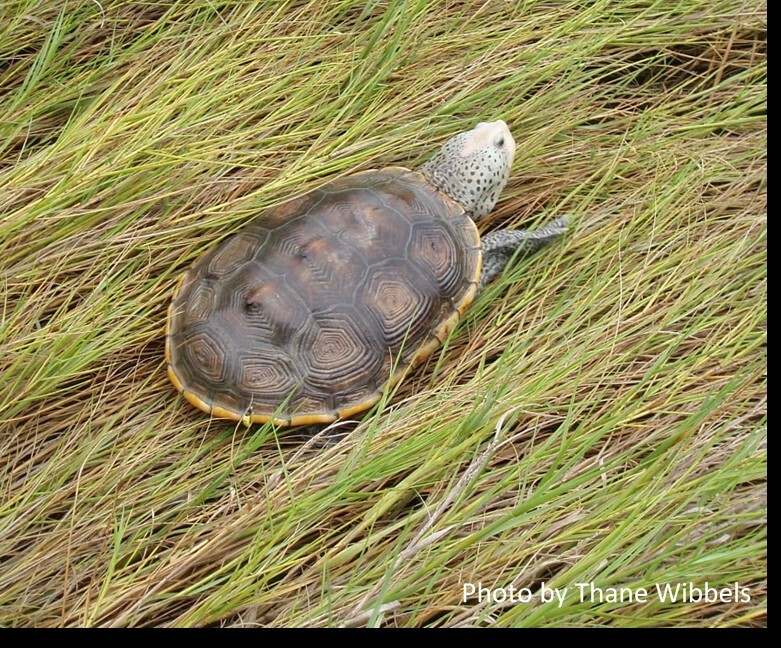 “The diamondback terrapin is a priority one species of high conservation in Alabama and is a crucial species for the salt marsh ecosystem,” states Dr. Thane Wibbels. Recently, Petre et al. (2015) found a genetic pattern between populations on the east and west sides of Louisiana, which may stem from the differences in habitat. The southeastern region of Louisiana’s salt marshes offer a more open network of marshes as a result of habitat fragmentation. These terrapins were known to be historically harvested as well, but no evidence of bottlenecks was found. In comparison, the southwestern portions of Louisiana’s salt marshes are more isolated with barriers, such as beaches and dunes. Drabeck et al. (2014) suggested that differing patterns of gene flow may be the result of migration patterns. It is rare for terrapins to migrate more than 10 kilometers to nesting grounds, but with the loss of nesting grounds due to anthropogenic and natural impacts, such as erosion and oil spills, individuals may need to migrate further. Thus, different management practices may be necessary in order to protect different types of populations. Interestingly, recent studies have suggested Louisiana terrapins share more genetic similarities with East Coast populations than with closer Floridian populations. Louisiana terrapins showed the greatest similarity with Carolina populations, which may reflect a translocation in the 1900s for farming and harvesting. Similarly, Converse et al. (2015) suggested translocation into the Chesapeake Bay for farming and harvesting resulted in distinct patterns of genetic diversity. Despite all the attention in the U.S., a population of terrapins was unnoticed in Bermuda until the early 2000s. Bermuda news reported the recently classified terrapin and the launch of the Diamondback Terrapin Project piloted by scientist, Mark Outerbridge. After their recognition, Parham et al. (2008) used radiocarbon dating of terrapin fossils and found were to be from approximately 1620 CE. Because the origins of the fossils predate human consumption of terrapin and almost predate human settlement of Bermuda, the authors suggest that the Bermuda terrapins are native species. Based on genetic patterns, the authors suggested that the terrapins arrived in Bermuda by way of the Gulf Stream, originating from the Carolinas. We are starting to understand terrapin population dynamics, but population genetic tools are still sorely needed in order to protect these turtles. Researchers are better able to continue to protect and aid recovery of the many species, like the diamondback terrapin, that have been and continue to be at risk due to anthropogenic impacts. Effects of By-Catch Reduction Devices (BRDs) on the Capture of the Diamondback Terrapin in Crab Pots in an Alabama Salt Marsh. Coleman, A.T., Wibbels, T., Marion, K., Nelson, D., & Dindo, J. 2011, The Journal of the Alabama Academy of Science. The Diamondback Terrapin: The Biology, Ecology, Cultural History, and Conservation Status of an obligate Estuarine Turtle. Hart, K.M., & Lee, D.S. 32, s.l. : Studies in Avian Biology, 2006. Population genetics of the diamondback terrapin, Malaclemys terrapin, in Louisiana. Petre, Charlotte; Selman, W., Kreiser, B., Pearson, S. H.; Wiebe, J. J. Conservation Genetics, 2015, Vol. 16. Analyses, The Status of Louisana’s Diamondback Terrapin (Malaclemys terrapin) Populations in the Wake of the Deepwater Horizon Oil Spill: Insights from Population Genetic and Contaminant. Drabeck, D. H., Chatfeild, M. W.H. and Richards-Zawacki, C, L. Journal of Herpteology, 2014, Vol. 48. Spatiotemporal analysis of gene flow in Chesapeake Bay Diamondback Terrapins (Malaclemys terrapin). Converse, Paul E., Kuchta, Shawn R., Roosenburg, William M., Henry, Paula F.P., Haramis, G. Michael, King, Tim L. Molecular Ecology, 2015, Vol. 24. Introduced delicacy or native species? A natural origin of Bermudian terrapins supported by fossil and genetic data. Parham JF, Outerbridge ME, Stuart BL, Wingate DB, Erlenkeuser H, Papenfuss TJ. Introduced delicacy or native species? Biology Letters. 2008;4(2):216-219. doi:10.1098/rsbl.2007.0599. This entry was posted in blogging, community ecology, conservation, evolution, natural history, population genetics and tagged conservation, natural history, scicomm, Science Communication, turtles. Bookmark the permalink.